Can you believe there are just ELEVEN more weeks until we go on stage at the Hackney Theater at Norfolk Collegiate on Saturday June 9th?! Our costume company has a NEW 45 day return/exchange policy. This means that instead of waiting for a single 2 week period for ALL costumes to be given out on a date that is closer to the show - we have accelerated the timeline to a "trickle effect." Q: Where is my student's costume, it's not on this list? A: Not all sizes and costumes are available or are in-stock this early in the year. Several classes have costume ship dates as late as end of April or Early May. Often, they ship early! Once we receive a "complete set" for ALL students in a class, we will distribute the costumes for that class. Q: I'm not sure about the look/fit of the costume that was sent home, what do I do? A: Costumes are tried on in class and the teachers and owner, Mrs. Lauren approve the fit of the costume before sending home. If a costume is DAMAGED, we will keep it to exchange. This is free of charge. If a costume does not fit and needs to be exchanged, we will keep it to return. This is free of charge if you completed your student measurement form. If you did not complete a student measurement form, there is a $5 shipping fee. We will be having an ALTERATIONS DAY with our studio seamstress on Saturday May 19th at 1 pm. We will be emailing our list of desired alterations based on in-class try-ons to come in on this day. If you would like additional alterations, inexpensive pricing has been arranged. Children's bodies are vastly different shapes and sizes, even more so than adult sizes if you can believe it! Ideally, all costumes will have a little "room" so that there are no itchy, uncomfortable areas from sequins, fringe, tutu's etc. This also allows for growth between now and June. Some costumes will be a little tight. All students will be wearing tights under their costumes as appropriate to cover the legs and bottoms for modesty. Some students get lucky and get a perfect fit. The reality is, that the students wear the costume on stage for a fleeting 2 to 4 minutes, and we can make it through that time! 1. Store the costume immediately on a hanger in the PARENT'S closet, away from the prying hands and eyes of the student. 2. Do Not Take the costume out again or try it on until Photo Week May 14-16. 3. Hang Tutu's upside down from the crotch of the leotard to keep the tutu fluffy and not squished. 4. Place all head pieces in a plastic bag and attach directly to the hanger. 5. Label the inside of the costume with your students name/initials IMMEDIATELY UPON RECEIVING. 6. Place in a garment bag to protect. Purchase a PERSONALIZED Music In Motion Glitter Logo Garment Bag with your students name! The schedule comes out 2 weeks before the scheduled competition on February 16th-18th and hearts drop as we realize, the venue has been changed from the close by Sandler Center in Virginia Beach to Chrysler Hall in Norfolk - no time to book hotels for a place to hang for lengthy times between scheduled routines. On Point Dance Competition is SOLD OUT and a popular one, for a good reason! The directors run an "On Point" and tight ship, with on time performances, great rewards and feedback and few mistakes. The event is also well attended by other Hampton Roads area dance studio's - making it a reunion of sorts for dance teachers who went to school together but now own schools or who teach or choreograph around the area and cheer each other on. And for dancers, whose friends from school dance around the city as well and can get to see their friends. The event begins at 5 pm Friday sharp, students begin to filter into the Chrysler Hall, searching out dressing rooms downstairs underneath in the cavernous space of the backstage of this iconic performance space in Norfolk, where opera's, philharmonics and professional dance companies perform. Dancers drag their duffels, packed to the brim with costumes, shoes, hairpieces, make-up, water and food while parents and siblings mill about. Getting ready backstage is such a special ritual to see the students perform. One student arrives and then carves out a tiny space for her bag and then decides what to do first. Another younger student is so proud to have been able to apply her lipstick and eyeliner but needs help with her eyelashes. Co-director Jessica Haynes along with junior student Bri Corcoran feverishly put the team's hair in 2 dutch braids, this season's determined team hair-do, until all girls who are performing hair-style is complete, let's hope they don't take it out before Sunday! Dancers from different studios filter in and out of the dressing room to go upstage to perform, pieces are short, just 2 and a half minutes, a fleeting moment of adrenaline and excitement on stage. As the clock ticks and the numbers of the dancers #53, #54 "Ok, we have 15 dances to go, let's go run this upstairs," our groups leave to run through dances for memory one last time before going onstage. One director will stay with the group backstage, checking them in and ushering them onstage, while the other team members not dancing as well as parent supporters and directors will go to the audience to watch. The good news is that On Point is our second competition event of the year. Music In Motion Dance Company attended DanceMakers convention in Richmond, Virginia in January, a 3 day competition and convention and overnight team building travel trip with some amazing master teachers! So we've already performed all of our pieces on stage. At On Point, #mimdanceco dancers performed 15 dances including group pieces, solos, duets and trios across a variety of genres. Over 3 days we performed as late as 10:15 pm and as early as 9 am and participated in 5 awards ceremonies. The students take home adjudicated scores detailing their technique and performance quality - the only true "competition" is their previous performance or next performance. The teachers take home video-taped notes with feedback, it's always beneficial to have secondary information on choreography and for students to learn from other master teachers. Saturday rehearsals, extra weeknights, long talks about dedication and applying yourself, watching the excitement of the dancers and seeing them excel and express themselves in such a beautiful and honest way on yet another stage makes it all worth it! Has your student missed a dance class at Music In Motion because they were sick, too much homework or a conflict with an outside activity? Here's how to claim your MAKE-UP classes at Music In Motion. -Make suggestions on appropriate alternate classes to "make-up" classes in. Decide which classes your student will attend and let us know! Add your student to the class roster and let the teacher know to expect them! Trying a new dance style can be exciting and open up new possibilities to what your student might enjoy! Going UP a level will be a big challenge and always something worth working towards. Going DOWN a level will help your student "get back to basics" and learn detail they can bring back to their own class. If you've missed a class, you can attend a free make-up class within 1 month of the missed class. Make-up classes/missed classes expire after 1 month's time. IE - if you missed a class in October, don't use that to get a free Acro class in May! Members of the Music In Motion Dance Company are REQUIRED to make-up all dance classes to maintain their level of training and commitment to their team and team members. Dancers placed in upper level (level 5) dance classes are REQUIRED to make-up all dance classes as a commitment to their level placement and to show their willingness to continue to work as a Level 5/advanced dancer. This excludes illness and excessive homework. Hope this helps! Call with Questions 757-340-1534. In Virginia Beach, October and November can still feel a lot like Spring-Time. And yet, June is still a long 9 months away! 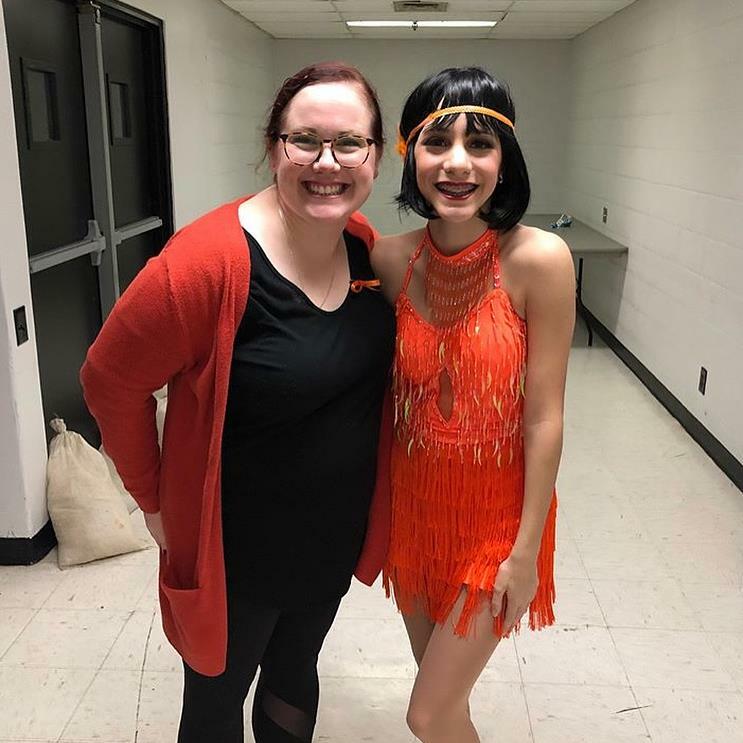 With a dance season only going the length of the school year, why are we talking about the "June Show" already, requiring costume deposits so early (December 1st by the way!) and what is the "June Show" anyways? We are a family friendly, easygoing and fun-loving atmosphere, but at Music In Motion, we take dance as an art form seriously as well. In fact, many of your student's instructors spent a pretty penny even studying it is a primary goal in college! That's dedication. Our studio has been a staple of the greater Hampton Roads Arts Community since its days as Children's Dance Theater in the early 80's and it's our goal to continue to uphold a reputation for quality, professional education not only in dance technique after school, but in the theater arts as well! Get your costume balance in on time. We order costumes as soon as we come back from Winter Break and they STILL take until May to arrive to the studio! There are likely 50,000 dance studios in the U.S - but I can only name under 10 costume companies off the top of my head, and trust 3 of them. Thus, costume deposits are due EARLY. Get the Costume Details here and cross it off your list before the holidays. We're skipping a few details here (tickets, rehearsals etc. which will come in the spring) to cut to the chase. Your child, on stage. Your family, in the audience. They've worked so hard all year to get to this point, they've improved, they've asked questions, they've grown, they're nearly 1 year older now (sorry!) This special day is for them to soak in the love, the wonder of the theater and arts experience. They get to spend a Saturday night backstage with new dance friends getting hair and makeup done then pulling on their sparkly, exciting costume. Feel the nerves of waiting in the wings and watching the older dancers dance and wondering "Will I be able to dance like that one day?" This is the June Show, and it is awesome! "I am very excited to be chosen as your Starlet. I am not sure if you are aware but I willbe a returning Starlet. So that could be good or bad depending on your perspective on it. Last time I performed a cha cha to Mandisa Overcomer. It was a very difficult dance but I did it and I believe I rocked it. So I felt great about it. I can't wait to learn something new...."
My first email from Dee Sanchez, my Starlet for 2017, who also is a self-proposed "Dance Mom" (If you're reading this blog, it means you are too, but if you aren't it means; seamstress, competition driver, eyelash glue-er and much more.) Not to mention she also has a background in Musical Theater and Vocals! Last year, Melanie Georges and I performed "All That Jazz" from Broadway & Fosse's Chicago and Melanie won Fan Favorite! My creativity at the beginning of the fall had not been flowing so far. It's my 2nd season at the helm of MIMDance and just 2 weeks after my wedding. Dee and I set a date to discuss costuming, music, style and plan out our dance, a 2 hour affair including laughter, making connections, storytelling and yes, I catch the tears behind her eyes as she retells thoughtful moments too. Dee has chosen a song perfect for the dance. We are immediately on the same page and all of the puzzle pieces fall into place. All she knows is that she wants to tell a story, all I know is it is my job to make that happen through dance, and I'm nervous as hell. Now I'm on the spot come up with a dance that honors this woman, her family and friends and their journey in just the right way in front of a huge audience. This is what choreographers and artists do, let's rock and roll! The afternoon starts with, "Music was an important part of my treatment, I would just sit with headphones on." while trying to channel the strength and bravery. In "Brave" by Moriah Peters, stand out sections of our journey through the dance and music include a portrayal of her husband during the lyric "Impossible is possible with you" and "No More running, no more hiding" where with me as her guide, we fight to untie her headscarf and toss it together joyously towards the audience before moving on with our dance. "Impossible is possible with you"
Dee tells me that she hid her bald head from chemotherapy treatments for a long time, not wanting to go out in public. Just 1 part of a journey that can seem so long is the moment when you can bravely "shed" that headscarf. Did I mention that we couldn't rehearse at all for the first 2 weeks due to Dee's foot surgery? That's right, Dee and I plan on dancing in just a few weeks EVEN THOUGH she just had surgery on her toes on her left foot. Dropping out of Starlet's is not an option for Dee, her toe surgery was necessary because of neuropathy in her foot caused by her chemotherapy treatments, a common and serious ailment and side effect in cancer patients. To Dee, it's just another step in her journey. "Dropping out of Starlet's is not an option for Dee." Once we dance on stage November 4th (at Sandler Center from 7-10 pm Adult Tickets are $25 and student tickets are $15 - get yours HERE) then we'll really show all aspects of the journey, bum foot and all! VOTE for us to be Fan Favorites - each vote is only $1! Getting invited to participate in Starlets of Dance in 2016 and continuing in 2017.